Osteochondral lesions (or fractures) of the cartilage, which sits on top of the Talus (ankle bone), most commonly occur in combination with an ankle sprain. An osteochondral lesion may not be diagnosed immediately. It may only be identified if a sprain doesn’t fully heal and the ankle continues to cause problems when further investigations would be made. 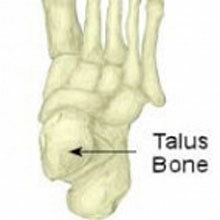 Symptoms of an Osteochondral lesion of the talus or ankle bone include pain in the ankle with swelling. The ankle may catch or lock and is likely to be stiff. More detailed bone scans, MRI or surgery may be required for a full diagnosis. Osteochondral lesions or fractures of the cartilage which sits on top of the Talus (ankle bone), most commonly occur in combination with an ankle sprain. This is especially common if the injury occurs when landing onto the ankle, as the Tibia above compresses the top of the Talus, damaging the covering cartilage. Osteochondral fractures in association with a sprain are often not detected initially. The sprain is usually treated and the ankle improves to an extent but may continue to cause problems such as pain and swelling after activity, at which point further investigations may be made. Large fractures may be evident on X-rays. MRI scans, isotopic bone scans, and CT scans are more likely to pick up smaller lesions. II a – Subchondral cyst. III – Chondral fracture with separate but not displaced fragments. IV – Chondral fracture with separate and displaced fragments. Grade I and II lesions are treated conservatively – i.e. with therapy and exercise, rather than surgery. Previously it has been recommended that the ankle is cast to immobilize the ankle and allow healing, however, this is no longer recommended as joint motion without loading has been found to promote cartilage healing. Weight-bearing activities should be avoided and instead replaced with cycling/swimming to maintain fitness and keep the ankle mobile. Grade I and II injuries which do not heal within 3 months may be put forward for surgery. Grade III and IV injuries require an ankle arthroscopy (keyhole surgery) to remove the separated fragments. A full rehabilitation program to regain ankle strength, flexibility and balance are then undertaken.